Foreword. Preface. Acknowledgements. The generalized microscope. Confocal microscopy : basic principles and architectures. Two-photon microscopy : basic principles and architectures. Cross-sections of fluorescent molecules in multiphoton microscopy. 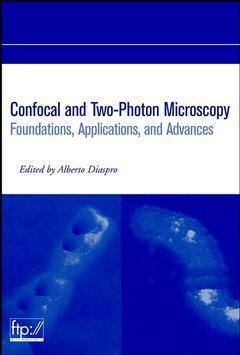 Resolution and contrast in confocal and two-photon microscopy. The role of pinhole size in high aperture two-and three-photon microscopy. Aberrations and penetration in in-depth confocal and two-photon excitation microscopy. Group velocity dispersion and fiber delivery in multiphoton laser scanning microscopy. Cellular and subcellular perturbations during multiphoton microscopy. Practical multiphoton microscopy. Sampling, resolution and digital image processing in the spatial and Fourier domains. Image restoration methods : basics and algorithms. Two-photon excitation fluorescence microscopy imaging in xenopus and transgenic mouse embryos. Multiple color fluorescence imaging in microscopy. Stereological methods for estimating geometrical parameters of microscopic structure by three-dimensional imaging. Imaging live cells in 3-D using wide field microscopy with image restoration. Confocal microscopy in the study of the cell nucleus. Confocal imaging of neuronal growth and morphology in brain slices. Fish imaging. Two-photon imaging of tissue physiology based on endogenous fluorophores. Two-photon near infrared femtosecond laser scanning microscopy in plant biology. Two-photon excitation microscopy for image spectroscopy and biochemistry of tissues, cells, organelles, and lipid vesicles while in physiological conditions. Real-time in situ calcium imaging with single and two-photon confocal microscopy. Superresolution in fluorescence confocal microscopy and in DVD optical storage. Photobleaching by confocal microscopy. Two-photon laser scanning microscopy for characterization of integrated circuits and optoelectronics.